1. Log in to PASS. 2. Select eTermination Checklist from your options in PASS. 4. Checklist will auto-generate. Instructions will be noted for all items that require completion. As you complete each item, change the status using the drop-down menu. 5. Add comments if you like. This is not required, but it is recommended if there is something specific about that item that you want noted, such as the title of a library book that you turned in, or the person to whom you turned in your P-Card. 6. Save and log out of PASS. You can do this as often as needed while you are completing your checklist. 7. Your last stop should be Human Resources, where you will turn in your Cougar Card. You may also turn in your Parking tag, or you may deliver it to Parking as you leave. 8. If you leave UH before completing your checklist, you can still return items or clear debt and update your checklist in PASS. 1. 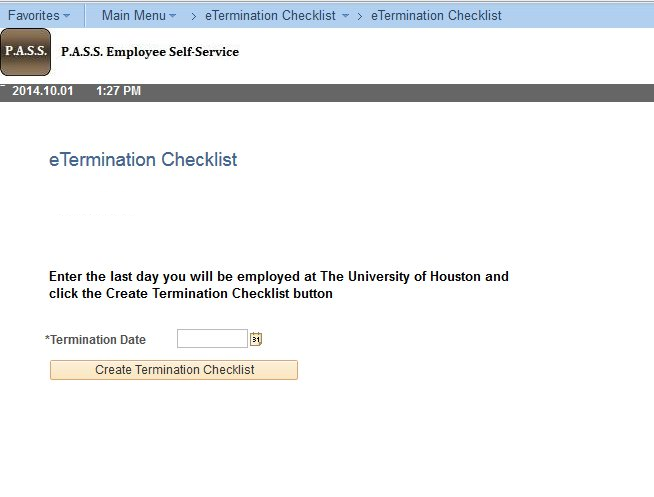 Why is the Termination Checklist now in PeopleSoft? What is the advantage to me? The eTermination Checklist queries other systems at UH to see if you have any outstanding items, and then generates a checklist that is unique to you. This saves you time by eliminating the need for you to go to areas on campus where you have nothing to turn in. The eTermination Checklist will also serve as a permanent record that you turned items issued to you. 2. There are items on my checklist that I do not have. Do I have to go to these locations anyway? 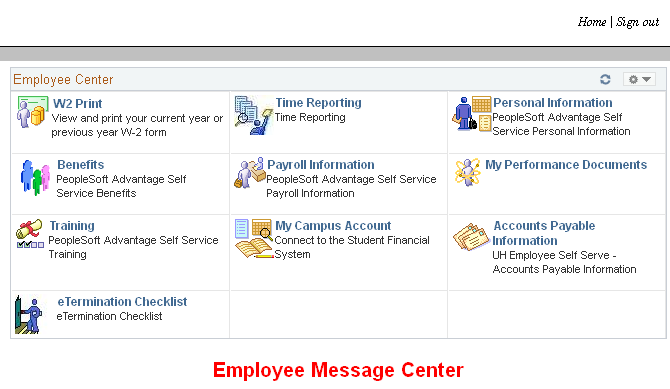 PeopleSoft does not yet communicate with all other systems on the UH campus, but we are actively working on building these interfaces to make the eTermination Checklist more user-specific. For now, if you see an item that does not apply to you and shows no specific items to be returned, you may select Not Applicable from the drop-down. Other individuals in the eTermination workflow will verify and close out those lines for you. 3. What should I do if my separation date changes or if I entered it incorrectly? Your department business administrator can correct this for you. 4. I did not initiate a checklist, but when I logged in to PASS, I saw that I have one anyway. How did that happen? Your Department Business Administrator can initiate a checklist on your behalf. The PeopleSoft System can also generate the checklist once a terminating ePAR has been approved. If your checklist is truly in error, your Department Business Administrator can cancel it for you.